Resulting from a 1937 requirement for a short-range reconnaissance plane with a single engine and accommodation for a crew of three, Richard Vogt, the technical director of Blohm und Voss's aircraft subsidiary, Ham­burger Flugzeugbau, proposed that an official RLM requirement could best be met by an asymmetric design. The result was the company‑financed Ha 141‑0, flown in Feb­ruary 1938 with Major General Ernest Udet at the controls. An unorthodox machine with an extensively glazed crew nacelle offset to starboard of the centerline and the 865-hp (645-kW) BMW 132N radial engine to port at the front of the boom supporting the tail unit. A perspex-glazed crew gondola on the starboard side housed the pilot, observer and rear gunner, while the fuselage on the port side led smoothly from the engine to a tail unit. The engine was a conventional radial piston powered machine spinning a three-bladed propeller system. The engine of choice became a single BMW 801A 14-cylinder radial of 1,560 horsepower providing for a 272mph maximum speed, a 1,181 mile range and a 31,810 foot service ceiling. The later pre-series Bv 141s would make use of only a single tail system, hence its asymmetrical arrangement. Despite this appearance, the weight of the aircraft was spread out quite well when in flight, relating to the Bv 141s good handling characteristics. It proved to be quite successful, so much so that an order was placed for three planes including the original, since that one was built with private funds. The original BV-141-V and A models had a conventional stabilizer. The aircraft's design prompted a mixed response from the RLM and had no impact on their decision to build the Fw 189. Indeed, an urgent need for BMW 801 engines for use in the Fw 190 fighter aircraft further reduced any chance that the BV 141 would see production. Though the RLM officials remained uncertain of its potential they awarded a contract for further for five Bv 141A developed versions with 960L‑hp BMW 132N engine and armament of two fixed and two rear movable 7.92‑mm (0.312­in) MG 17 and four 50‑kg (110‑lb) bombs. Lengthy trials in 1939‑40 were favourable, but the RLM claimed that the oddity was under-powered as an excuse to avoid large ­scale orders. The German air ministry preferred the competing Focke-Wulf Fw 189, but the manufacturer’s enterprise in building three prototypes, the last two somewhat larger than the first, paid off in an order for five pre-production By l4lAs. These were evaluated up to April 1940, but no production was ordered even of the more powerful Bv 141B. Vogt had anticipated this and in January 1941 flew the first completely re­designed Bv 141B with 1560‑hp BMW 801 and larger airframe of different shape, includ­ing an asymmetric tailplane, first tested on the V2 prototype, designed to improve the rear gunner's field of fire and which had resulted in no noticeable deterioration in handling qualities. Only five B-series aircraft were built, making 13 of all versions. 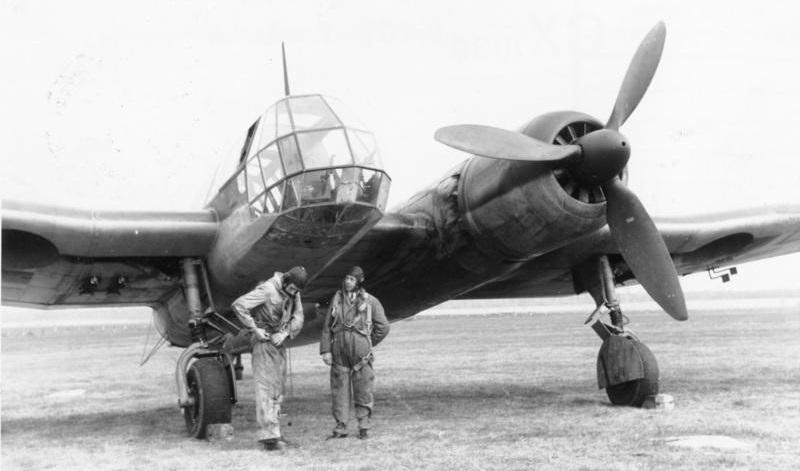 No 10 was used operationally in the autumn of 1941, but this unique aircraft was eventually dropped as the twin-boom Fw 189 was an adequate tactical reconnaissance aircraft and the Blohm und Voss shops were needed to help make the Fw 200C Condor after an air raid had damaged the Focke-Wulf factory complex at Bremen. 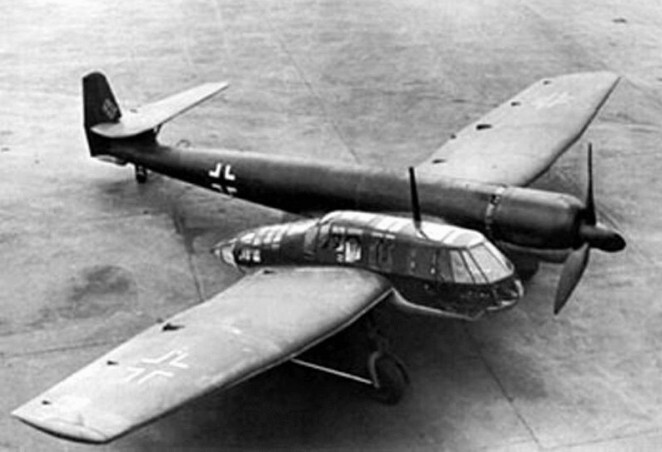 Some 38 Bv 141 examples were known to have been produced though none survive today. Several were recovered by the Allies. In all, there were three V-series prototypes designated as V1, V2 and V3. The pre-series models numbered five examples under the Bv 141 A-0 branding and became V4 through V8. These were followed by the revised Bv 141 B-0 preseries models from V9 through V18. There were eight Bv 141 B-1 series models thereafter. All further development was cancelled in 1942. The Ilmavoimat / Maavoimat / VL team evaluated this aircraft and conducted a series of test flights over April/May 1938. The performance was found to be good and the observation visibility excellent although STOL capability was lacking. Overall though, the design was rather too radical for the Finns and while it remained in consideration, it was as a “possibility” rather than up for firm consideration. Range: 746 miles (1,200 km). Maximum take-offweight: 13,448 lb (6,100 kg). Armament: two fixed MG 17 and two trainable MG 15 0.312-in (7.92-mm) machine guns, and four 110-lb (50-kg) bombs.